As used herein, the term "personal information" means information that specifically identifies an individual (such as a name, address, telephone number, mobile number, e-mail address, or credit card number), or information about that individual that is directly linked to personally identifiable information. Personal information does not include "aggregate" information, which is data we collect about the use of the website or about a group or category of services or users, from which individual identities or other personal information has been removed. This Policy in no way restricts or limits our collection and use of aggregate information. Active Collection: We collect information from you in various ways when you visit the website. For example, we collect information you voluntarily provide to us, such as if you create an account, send us an email, fill out a form, register for an event, provide or request information, or post comments or other content on the website. Such information may include personal information, such as your name, address, email, telephone number, other contact and demographic information, and credit card number. Personal and demographic information may also be collected if you provide such information in connection with creating a profile or group, leaving comments, submitting or posting content, sending an email or message to another user or participating in any interactive forums or features on the website. 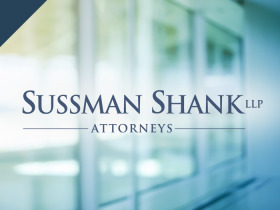 in connection with, or during negotiations of, any merger, sale of company assets, financing or acquisition, or in any other situation where personal information may be disclosed or transferred as one of the business assets of Sussman Shank. If you have any questions about this Policy, please contact Denise A. George, dgeorge@sussmanshank.com or 503.227.1111.